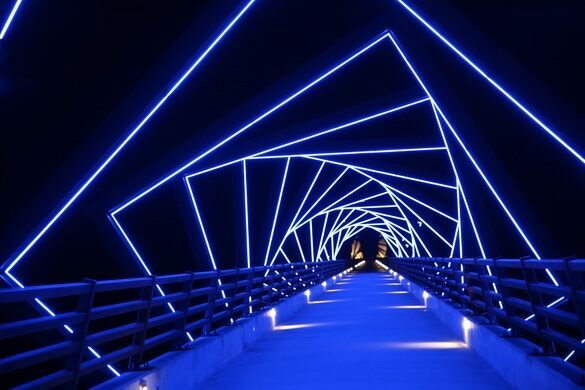 Half a mile long and 13 stories high, the bridge over the Des Moines River Valley lights up the wide night vista. 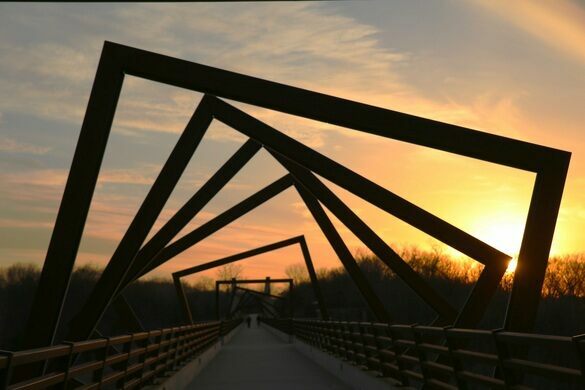 A 25-mile trail winds its way through five Iowa towns, from Woodward to Ankeny, with a dramatic crossing over the Des Moines River Valley. 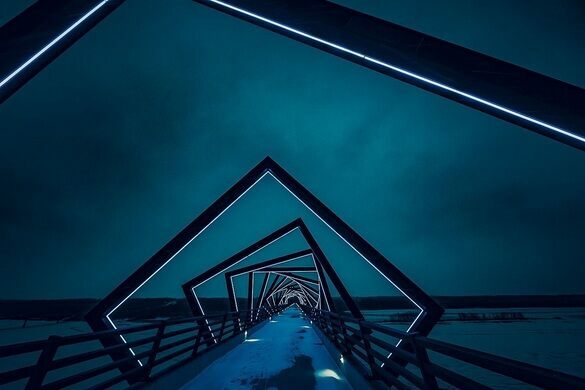 The High Trestle Trail Bridge is half a mile long and 130 feet high, and is said to be among the largest trail bridges in the world. Both the trail and the bridge started out carrying freight for the Union Pacific Railroad, but when the trains stopped running, a combination of donations, grants, and public support helped turn the ribbon of rails into a multi-county path for hikers, bikers, and horseback riders. 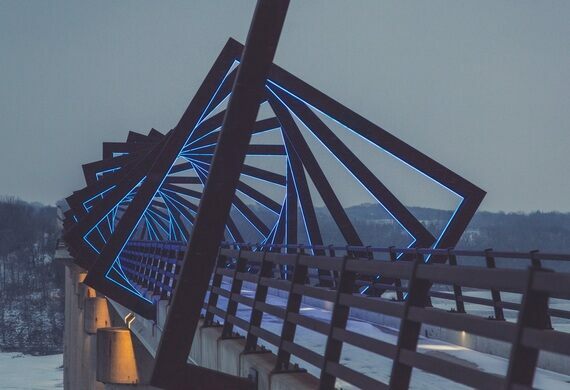 The bridge, a spectacular feat of engineering, connects the trail, encircled at its center by an art installation of raw steel and ambient lights. It took years to fund the ambitious project, and Union Pacific did its part by letting the 439-acre length of land go for next to nothing. With some Congressional and local money, in 2008, 20 miles of trail opened to the public. Finally, with the help of Iowa’s Arts Council, the bridge project got underway with two local Des Moines companies at the helm: engineering by the firm Shuck-Britson, and the design commission going to RDG Dahlquist Art Studios. The spiraling steel frames around the concrete roadbed are intended to evoke the sense of descent into a mine shaft, a nod to the history of mining in central Iowa. 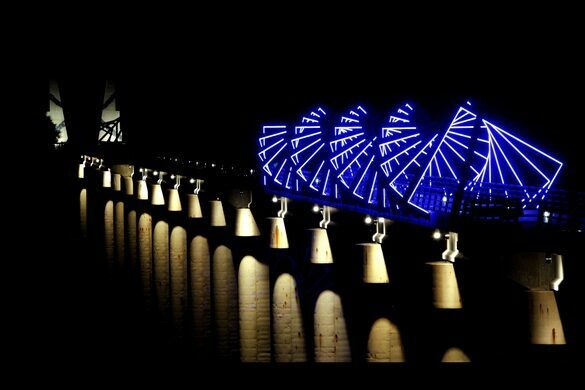 The lights, switched on between dusk and midnight (a little earlier in the winter months), reflect in the river below, uniting the “rails to trails” project to the wide vistas of the landscape. The long trail stretches east-west through central Iowa. 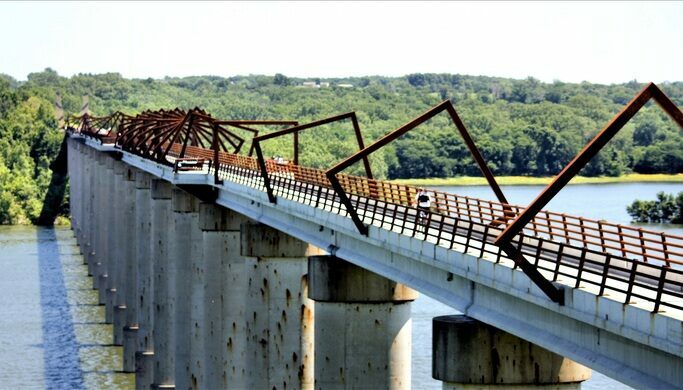 The bridge is about 3 miles west of downtown Madrid, crossing over the Des Moines River. Beating out all other concrete competitors, this massive garden feature's pointy hat has earned it a world record. The “American Gothic" artist's largest works hang in an Iowa State University library. A small burial plot stranded in the middle of a road. The magazine keeps a perfectly groomed display garden for its photo shoots. This spectacular bridge supported by two gigantic hands looks like something out of a fantasy universe. The largest brick bridge in the world.